How many wedding venues have a Hilarium? Or a fabulously high domed window you can fill with paper lanterns to create the most colourful, contemporary yet whimsical wedding styling? The Matara Centre is a Grade II listed regency home, with fabulously different spaces where you can say your vows. We’ve featured weddings here on the blog so many times – our favourite space is the courtyard space filled with greenery – but there are five individual gardens here, all with a spiritual vibe for you and your guests to explore and enjoy. Many classic British children’s books feature the main characters doing something adventurous and daring, like camping out in a cave, climbing a tall tree, or rowing to an offshore island. You can revisit your childhood in the best way at your wedding by choosing to get married at Treetop Escape’s intimate wedding venue, which features stunning views of the North Devon and Exmoor countryside. While the ceremony itself takes place on the ground, inside the specially-designed Nest, it still maintains a beautiful natural feel, with floor to ceiling windows to let in the light and the views, and a veranda for unique picture opportunities. The happy couple can also have exclusive use of the 5-star tree house, linked to the Nest by a walkway. It offers all of the luxury and technology that you won’t find in a Famous Five book, including a hot tub, dinners prepared by a local chef, and spa treatments. Whether you’re a veteran, a history buff, or you’d just really like to get married on your own private island, the Solent Forts are the locations for you. There were four forts built in the middle of the Solent waters to protect Portsmouth, home of the Royal Navy, from attack by enemy forces during the Napoleonic Wars, but construction wasn’t completed until after the wars were finished. They remained as naval defences and were upgraded accordingly until after World War Two, when they were decommissioned and sold off to create luxury hotels. Spitbank Fort and No Man’s Fort are available for private hire, but as both locations are in the middle of the sea, you won’t be able to get here in a Rolls Royce or a horse-drawn carriage. Instead, you and your guests will need to be flown in via helicopter, or jetted in on speedboats. Talk about making an entrance! The Solent Forts can accommodate up to 200 guests for the ceremony, reception, and an overnight stay. Key facilities include: rooftop sauna and hot tubs, fire pit, wine cave, cabaret club, dance hall, sun decks, laser battles in the cellars, and a spa. This Grade II-listed building was featured in the Domesday Book in 1066, making it about as old as the British Monarchy itself, and was even once owned by Richard III. But its historical significance doesn’t end with royalty; it also served as a headquarters for the Allies in World War Two. By the turn of the century, however, this stately home was on the brink of dereliction. Thankfully, it was lovingly restored by property expert Sarah Beeny on the TV show “Sarah Beeny’s Restoration Nightmare” and now serves as an idyllic events venue and the backdrop of some famous BBC dramas. If you want to get married in a location fit for an Austen novel, then look no further than Rise Hall. Bonus: You can hire out the whole of Rise Hall for the entire weekend, with the wedding party arriving on the Friday for drinks and a rehearsal dinner, before a Saturday wedding, and a relaxed barbeque on the Sunday before the guests leave in the evening. The West Mill, Derbyshire. Photo credit: Mike Plunkett, from the English Wedding archives. This magnificent Grade I-listed building, dating back to the early 1800s, is now a beautiful location for weddings and offers superb views of the local countryside from the gardens and courtyard. The old cotton spinning mill, located on the river Derwent, played an important role in the industrial revolution, but following its decommission, the four-storey building remained empty for many years. Now, it’s been transformed into a stunning wedding venue, but has retained the building’s vintage charms by keeping the original architecture, like barrel-vaulted ceilings, exposed brick walls, cast iron columns and wooden beams, intact. 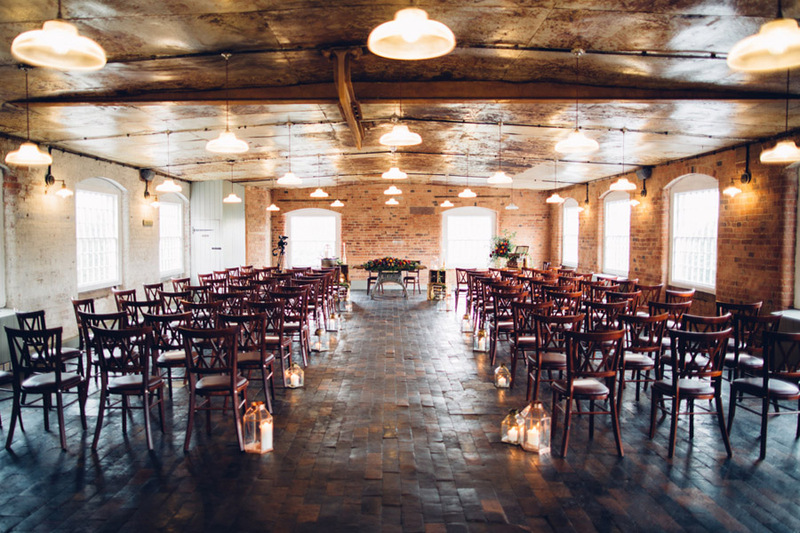 This venue is perfect for anyone who loves industrial architecture, the English countryside, or British history. 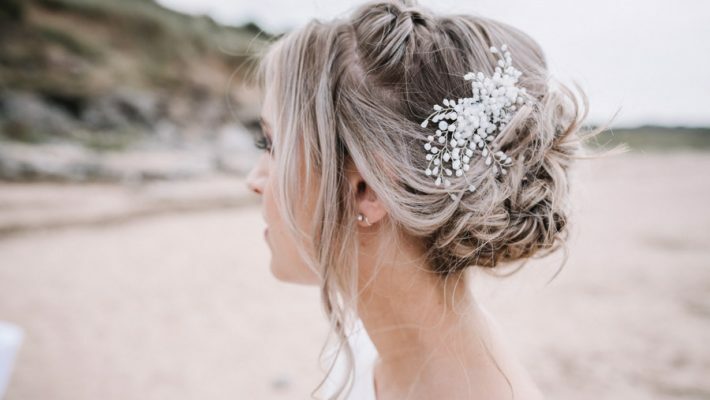 The events team is happy to work with the happy couple to customise the weddings to their tastes, and accommodate a range of themes and price ranges. This is one for the nature lovers out there; begin your married life in an ecological wonderland, filled with unique flowers, exotic wildlife, and conservation programmes. The Garden is a beautiful venue, featuring enchanting flower displays, breathtaking lakeside walks, and an incredible mix of modern and historic architecture, which will make for stunning photos for your wedding album. The Outdoor Performance Stage – only available on dry days, this oak-framed open-sided building is in the Outer Walled Garden. Bonus: You won’t need to pay for a florist, except for the bouquet! Photos can be taken in all areas, and all guests receive free entry to the gardens. This historic Grade I listed castle in the Western Lake District is the perfect place for a fairytale wedding. The estate dates back to the time of King John, but was extensively remodelled in the 1800s and again in the 2000s to restore the relic to its former glory. The castle gardens, which provide beautiful views of the Esk Valley and the mountains, contain an owl sanctuary and a maze. The team at Muncaster will tailor your wedding entirely to your tastes, allowing you exclusive use of whatever rooms you choose, setting an exclusive menu for the wedding breakfast and a three-course dinner, and even providing accommodation in the 4-star Coachman’s Quarters Bed and Breakfast, situated in the castle gardens. If you choose to wed at Muncaster, be sure to look at the Luck of Muncaster, a glass drinking bowl given to Sir John Pennington by Henry VI in 1461. Legend has it that, Henry VI believed they would prosper so long as the glass remains intact, which it still does. Who knows — some of that luck could rub off on you and your beloved. Cost is a major consideration for anyone planning a wedding, and the venue will often be the biggest financial outlay. But there are plenty of methods to save money on it. The place to begin is research. If you really love an extremely expensive venue, try to find similar venues with lower prices, and find out what the differences are. You might discover your that your expensive venue has included an open bar, or accommodation in the price. Then you may be able to bargain for a lower price by removing those extras. The key is negotiate, negotiate, negotiate. If you’re not familiar with haggling, then here’s a handy guide to negotiating a better deal with your venue. If you need to gain confidence before you start haggling, take a friend to the market to show you how to ask for a discount (confidently, but politely), and when to walk away. Take some time to practice it yourself. You could even try renegotiating your cable or mobile contract as well. There’s no doubt that the venues on this list are incredible, but some of them may be nowhere near you. If you live in Perth and you want to get married at the Solent Forts, you’re looking at a nine-hour drive or a moderately priced flight. Even if you’re happy to travel a long distance for your big day, you need to consider whether your guests will be, particularly if they are elderly, have young children, or are on lower incomes. There are some ways that you can negate the cost of the journey and make sure that all your guests are well rested (hiring a coach), but you might also want to look into splitting up the journey for those who couldn’t do the whole journey in one day (arranging a bulk hotel booking at a midway point). Is there somewhere on-site or close by for the wedding party to stay over the night before the wedding? Can the ceremony venue also accommodate the reception? If not, is the reception venue close enough that no guests will get lost en-route? Does the venue have overnight accommodation for all the guests on the day of the wedding? Are there any facilities (i.e. spa, horse riding, pool) to entertain the guests at the venue? That’s about it from me on stunning British wedding venues, and now I’d like to hear from you. Have you hosted your wedding in one of these incredible locations? What locations have I missed off the list? Has this list helped you pick a wedding venue? Let me know all that, and more, in the comments below.